Offering you a complete choice of products which include rice mill heat exchangers. Supported by a group of very gifted and accomplished experts, we are profoundly engaged on giving a wide range of best quality Rice Mill Heat Exchangers to our prestigious customers. 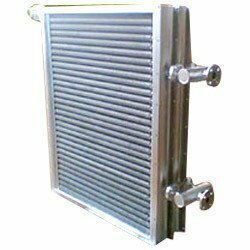 Our offered mill heat exchanger is made by our talented experts utilizing preeminent evaluation crude material and forefront innovation in similarity with industry quality benchmarks. With a specific end goal to guarantee its perfection, our quality specialists test this mill heat exchanger on various quality parameters.These are appreciated in the worldwide market and are offered at the competitive prices.